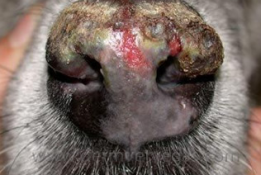 Pemphigus is a medical name for an entire GROUP of autoimmune issues which may make themselves known by the negative health effects they have on skin areas of the pet (usually dogs) and, with some frequency, mucous membranes within the body. 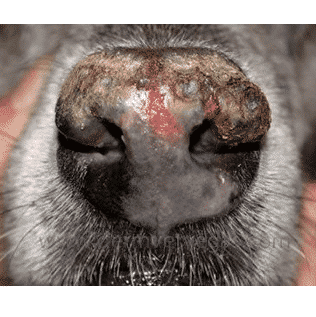 Resultant blistering or eruptions of the skin or the affected membranes is likely to result in significant discomfort and varied levels of debilitation for the unfortunately affected dog (or occasional cat). The foundation for this kind of rather bizarre “immune system gone crazy” condition lies in a malfunction of the body’s own methodology for resolving issues. This is the crux of what is termed ‘autoimmune diseases’: the immune cells, or antibodies, have been fooled by something gone ‘amiss’, and subsequently attack the cellular material responsible for the “glue like” attachment between granular cells. When such cells of the body proceed to separate because of that missing ‘tacky agent’ (called desmoglein), then you have the beginning or formation of the troublesome and painful BLISTERS that create disability. As things progress, the blisters tend to slough off, leaving a different variety of sores. 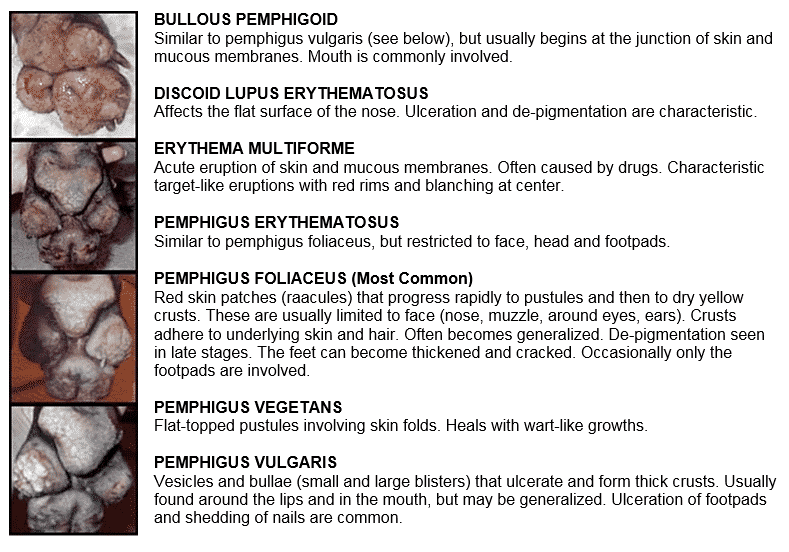 As was mentioned at the outset, pemphigus involves a fairly large group of these complex ‘immune malfunction’ conditions. The chart below provides some highlights of many of the more common forms of damage that may result from such aberrant immune system behavior. 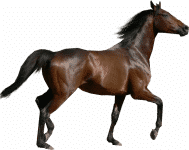 This can help, especially visually, to increase at least a minor understanding of this bizarre health concern generally referred to as Pemphigus. CLICK for a larger version of example photo. 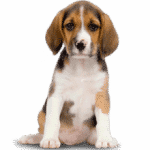 In dogs or cats, Pemphigus Foliaceus is the most common of these immune-mediated skin diseases. 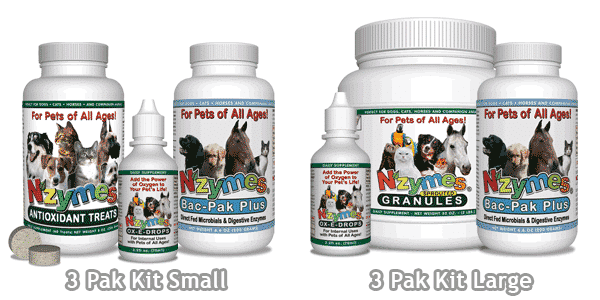 In this form, the separation of granular cells may cause ulcers or crusts to appear generally around the eyes, ears, pads of the feet, groin, and across the bridge of the nose. The Akita seems to be especially predisposed to the development of this condition. In cats, lesions often occur at the toenail beds creating crusty, sore feet. Pemphigus foliaceous is usually spontaneous but can also be drug induced or can result as a reaction to years of chronic skin disease.